For birthday's at the library I like to make a special treat for the birthday girl or boy and get them a card for the staff to sign. 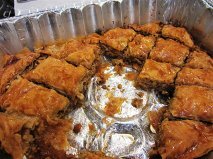 For Helen's birthday I had over heard her talking about liking baklava and I figured, "I could do that." I have a lot of confidence in myself, ha ha. 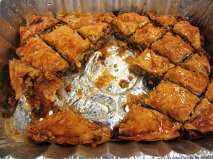 I do have to pat myself on the back because for never having made baklava before this turned out very well. Baklava tastes really good too. I have never had it before. It's like eating crispy pecan pie. Quite yummy. Baklava seems very intimidating to make but I didn't think it was that bad. If you are a beginning baker then you might not want to tackle baklava for your first project but sooner or later you should give it a try. I used Pioneer Woman's recipe and I'm just going to leave you with her link. The only thing I did differently was butter the phyllo sheets in the pan. It was easier for me. Enjoy!